The Wildwood wishes to address the real question, the true heart of the matter, not what I want to address, it’s what I need to address. Oh boy! I’ve been feeling quietly rebellious these last few days, since my last post. I’ve a to-do list for my business as long as my arm, my to-do list for the house and home is longer and like Pru from an episode of Charmed, I need more than two of me! The thing is, where to start on both fronts?! As far as the house and its chores are concerned, I’ve started / continued last years project of finishing off the decorating in the office. That can then help me get organised with the business and give me a dedicated area from which to work when the eldest two are at school and the baby is asleep. Is this enough? I ask the Tarot. 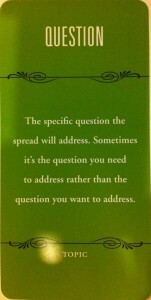 The World Tree came out in answer and I then pulled a context card from 1000 Spreads and pulled the “Question” card. Is it enough? is the question I want answered, but it’s not the one I need answering. What then is the question I need answering? That took me a few moments to work out. What I need to know (be reminded of) is that no matter which way I go around the labyrinth of life, I’ll get to where I need to be. Either way will take me there, I just have to keep going, start doing (elephant task!) and live my life. Is it the right way, did I make the right choice? What if the other way is quicker? The fact is, it’s not about how quickly we get out of the house that is in the base of the Great Oak Tree, or even how quickly we get back into that house, it’s the journey itself. We’ll learn what we need to learn either way, this isn’t a race, the journey itself is the important factor here. The apathy and indifference that I have to life at the moment is partly because I am bored and disconnected from my spiritual self. I hardly seem to have any time to breathe, never mind work on any rituals, or enjoy my Tarot. So I have to make the time, as well as do the hundred and one other things I have to do. There is but one of me. Yes, I could ask the husband to help, but I’m picky about my decorating and the finish, plus I can hang wall-paper! Himself however will have bricks to lay in the fireplace soon enough; that I do not wish to do. So, the real question, extending this out to you today is this: What do you really need to know? Not what you want to know, but what do you need? Take a look at the World Tree card, meditate on this card for a few moments whilst you think of your real question. When you’re ready, I’d love to hear it via the comments! As usual, the deck is my working, trimmed copy of The Wildwood with the context provided by Tierney Saddler’s 1000 Spreads. 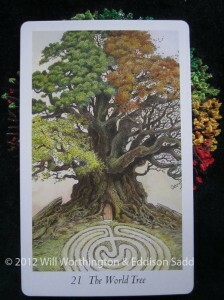 Excellent blog, Priestess Tarot. Will try the meditation and finding the question that needs to be asked……..(when I find the time!) lol. I know the question, “what do I need?” at the moment. My dearest friend has been severely ill, in & out of hospital frequently over the last 6 months or so. She has just gotten back out after being in there for just over 5 weeks. It is a medical condition with at best , what seems a poor prognosis. To know what is the very best way I can support her through this time. Some days are rather hard… as I know they are for so so many others out there too. It’s just that I like to solve things if possible- not win. Though this circumstance is a wait & see, which has involved a lot of waiting & seeing over the last 2 yrs or more since this began. Great post. I can relate to this on so many levels and at this time, I am having to return to what is needed, not desired. That is the hard part, because sometimes the desired product looks so much easier. Then once I receive what is needed, I stop complaining and state in a small voice “mkay”. Ha! 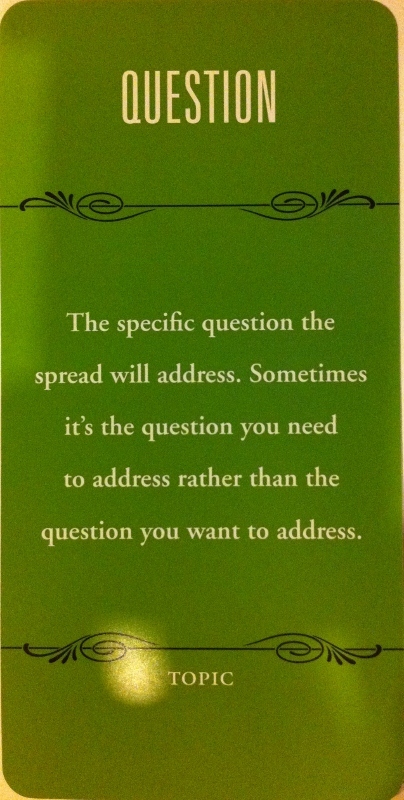 That’s a great take on what to think about when the card does not seem to be answering what you want to know, that we need to consider what we actually need to know. Thanks, Louise! It is a strong enough reminder into the tarot notebook it goes. Hi Amanda! Thank you very much for the post! That is the trick of life, to work out what we need. Thanks for your kind words Louise. I do appreciate them. Sometimes kind words as you have put forward here are enough to make one realise that they are doing the best they can… it just got a bit frustrating lately. You know, sometimes it’s just enough to know that other people care…. this helps… a lot… & it does much alleviate the question (for me) of what we need. There are no answers to some things, except perhaps, you are given what you need? at any particular time. This may pleasant, it may not, though often you are given what you need, not what you want, then… consider what to do with it , if one even noticed. I have been doing quite a bit of reflective writing on this very question of late. I would say I know what I need in terms of discipline and focus for a project that has “wandered away” from me. But what I don’t seem to know is what I need that will bring me to doing what I know I need to do!! I think we often know what we need but don’t want to look it directly in the eye. It’s easier to pretend we don’t know. Yes, all of it–our procrastination, our lethargy, our discontent–is part of the process, but that doesn’t mean we enjoy it any more. Looking forward to finding my connection to myself and feeling the energy return. Hi Judy!! Spring certainly brings out the spring cleaning, not just “house” spring-cleaning but within ourselves too. However, the only way we’ll move on and grow, is to spring clean within, thoughts, habits and attitude too.